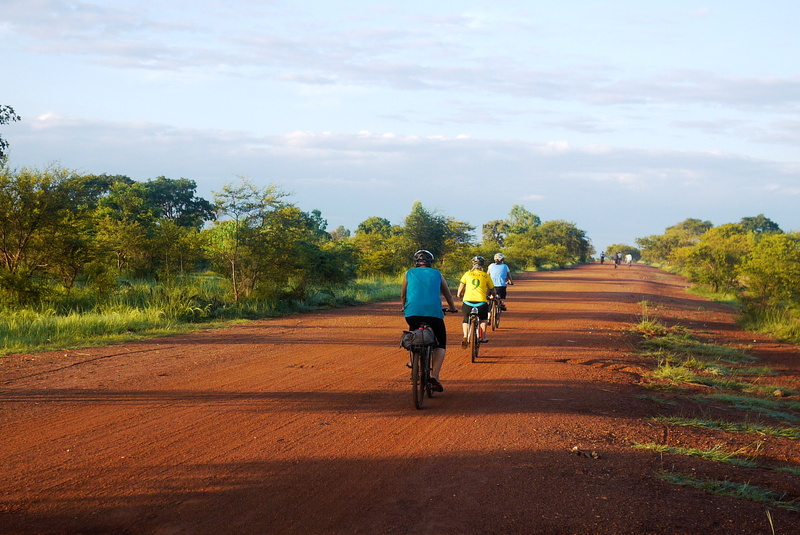 Early morning riding outside of Zabre, Burkina Faso. 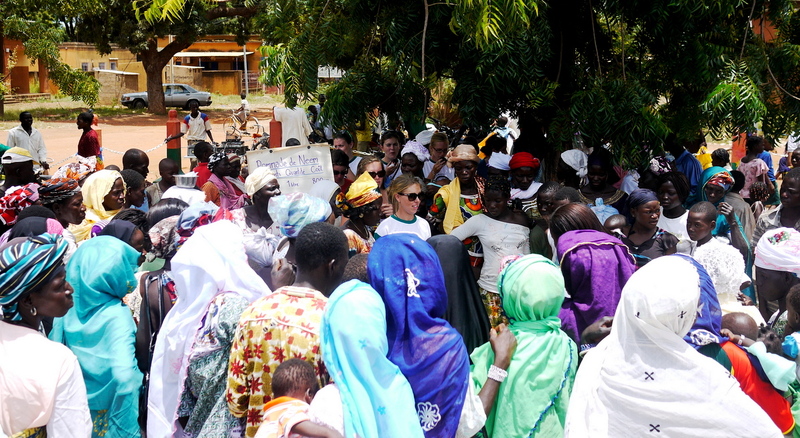 1,875 km later, the 2nd annual Burkina bike tour has come to a close with its arrival in Ouagadougou to help kick off the festivities at the Peace Corps 50th anniversary fair. I was able to participate in the last week of the tour (600+km) and really enjoyed the opportunity to see so many places, get a sense for some other PCV projects, and of course to test my riding endurance. My favorite part of the bike tour was that in almost every stop along the way, we had some sort of event upon our arrival. Sometimes it was just a meeting with a local business owner, while others were health information sessions, tree plantings, or dancing. Jamming in all of these events back-to-back was really uplifting and a fun thing to be a part of, especially as a typical week for me rarely involves more than one big event. It wasn’t always easy however. Constant 3:30 or 4am wakeup times, a few incredibly hot days, logistics for 20+ participants, rain, and other obstacles made it quite an exhausting time. Group shot in Ouaga of all PCVs who participated on any leg of the tour. …[W]e PCVs met up with large group of Burkinabe children lured by the twin enticements of candy and strange-looking foreigners. 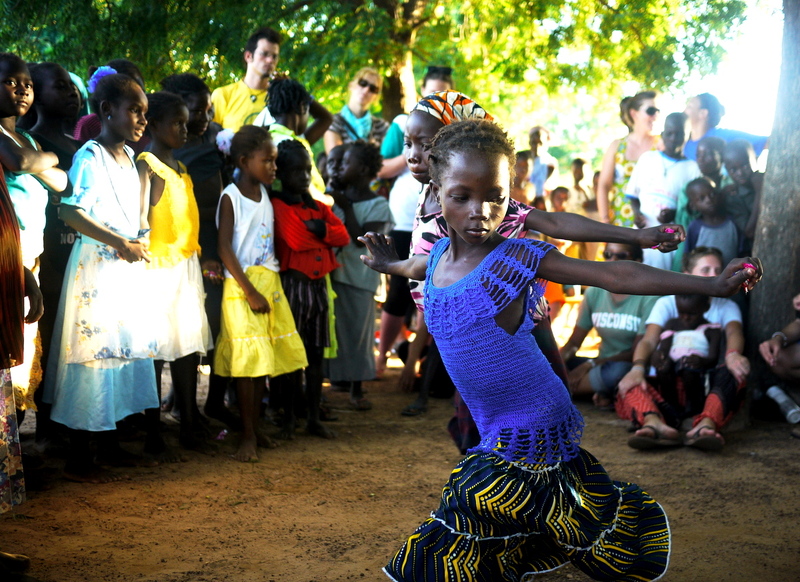 We split up into six groups, each one composed of a mix of local kids and PCVs, and each one given a village-life theme such as “farming,” “soccer,” or “food preparation.” The groups were then assigned the task of creating a dance based around their theme. Some groups had difficulty at first, especially those with smaller children who spoke little French, but after a few icebreaker games for teams to get to know each other begin bonding, they were all off on their choreographic mission at top speed. After an hour of planning and practice, a good number of community members had wandered into the health center courtyard to see what all this dancing fuss was about, including several previously invited local officials and traditional drummers. We gathered everyone in a shady area, talked for a bit about the bike tour and its goals, introduced all the riders, and then got dancin’. For a closer look at our day-to-day life on the bike tour, check out the official bike tour blog (or at least be sure to read the post I wrote about our 116km day from Tenkodogo to Beka). I plan on participating again next year, but next time hope to be able to do the whole thing, and break the 2,000km barrier. Kailey demonstrating how to make anti-mosquito cream with neem. Two-thirds of the way through the Tour de Faso, 25 PCVs arrived in Fada N’gourma, the capital of Burkina’s eastern region. Many rode their bikes from over 130km from Bilanga (a longer distance than expected as a washed-out road caused an unexpected detour). Others arrived fresh – planning, like me, on joining up to do the last week of the tour. With so many people in town, we seized the opportunity to have a small fair in downtown Fada. Joey and Luis organized quite a large event in the town square where activities included making soap and anti-mosquito cream, talks on nutrition, and local actors performing skits about female excision and domestic violence. We even had a small market of artisan goods and specialty food products. Other tables were set up as an expo where a few other NGOs and associations gave information about their organizations. A local acting group performs. Biking is big here for PCVs here in Burkina. Our Trek bikes are our constant companions, and one just has to look for the required helmet to identify whether another foreigner is a PCV (we’re the only ones wearing them). I’d be lost without my bike as I use it for every trip outside my house – to the office, market, etc. My site is pretty spread out, so walking isn’t really an option. I even bring it with me when I travel and cram it under or on top of whatever mode of transportation I happen to be taking. For one week in September however, I’ll be using it as my sole mode of transportation, as I’ll be participating in the final week of the 2nd Edition of Le Tour de Burkina! 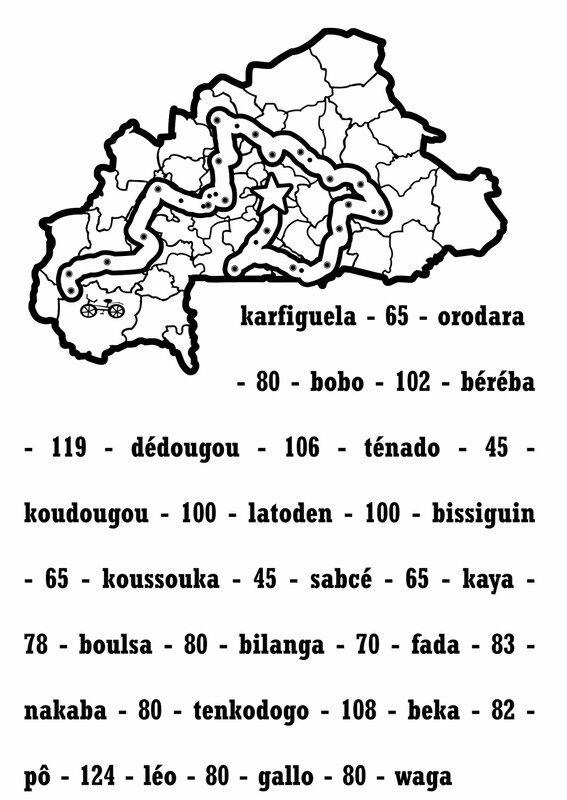 I’ll be biking from Fada N’gourma in the east to Ouagadougou (through an indirect southern route) and staying with other PCVs along the way. This year we’re aiming to top $6,000 in total donations. All 100% tax-deductible donations will be through the Peace Corps Country Fund and will go directly to funding volunteer projects. 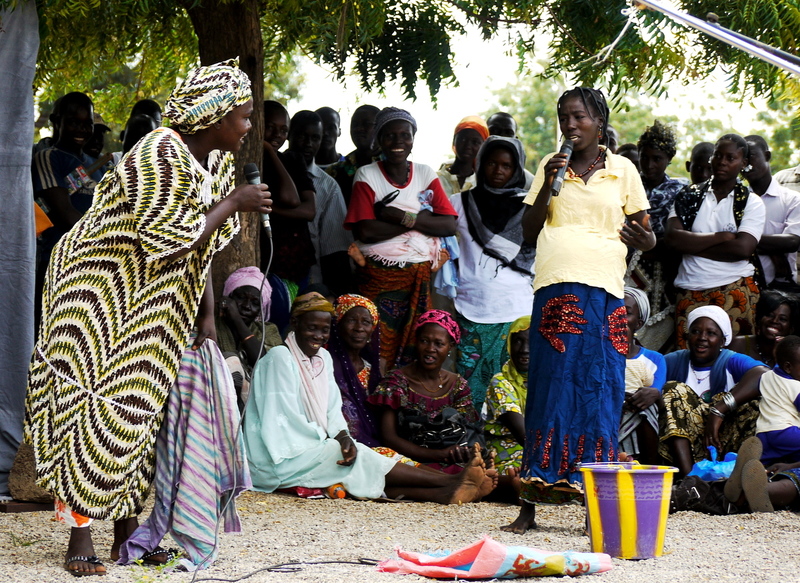 And in Burkina Faso, one of the poorest countries in the world, even a small donation can go a long way. As we get closer to the start of the tour I’ll put up more information as to how you can help out. The tour will end in Ouagadougou and coincide with a huge PCV-run fair and the swearing in of 50 new PCVs (who arrived in country a few weeks back). The fair will feature many of the people we work with, who will be selling their various products, giving trainings, and enjoying themselves. Floby, perhaps Burkina’s most famous musician, will be performing and even introducing a new song written just for Peace Corps. 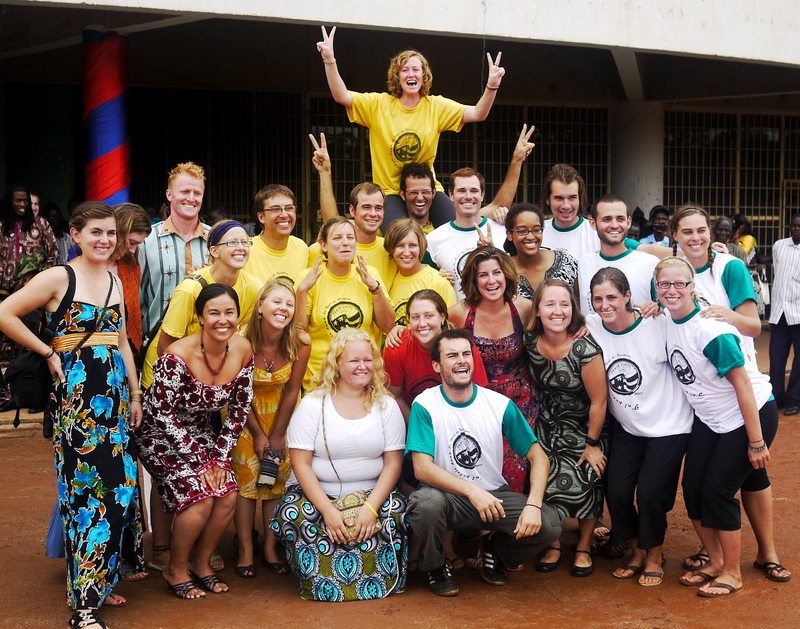 So there you have it – Peace Corps’ 50th anniversary and 50 new volunteers, all in the 50thanniversary year of Burkina Faso’s independence – pretty amazing, huh?